Hope Grip Doctor Bar Ends are there to protect the ends of your handlebars when nothing else can, the styling matches that of the Hope Hed Doctor to give you a very complete look. You Save £2.05. Wheels & Tyres. 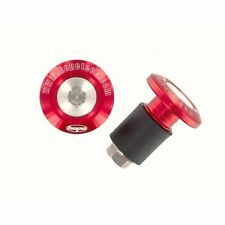 Hope Grip Doctor Aluminum Bicycle Bar End Plugs Red Road MTB Bike. Hope Grip Doctor Aluminum Bicycle Bar End Plugs Black Road MTB Bike. Hope Grip Doctor Aluminum Bicycle Bar End Plugs Blue Road MTB Bike. Hope Grip Doctor Aluminum Bicycle Bar End Plugs Silver Road MTB Bike. Rubber wedge expands safely inside the bar for maximum retention. Protect your handlebars while adding a dash of class. Our motto is 'All Riders, No Attitude!'. We're here to provide friendly and personal service for all cyclists. We owe it all to listening to you. Rubber wedge expands safely inside the bar for maximum retention. Protect your handlebars while adding a dash of class. Color Blue. Defined Color Blue. Reference Number: 3S23E5. We owe it all to listening to you. Rubber wedge expands safely inside the bar for maximum retention. Protect your handlebars while adding a dash of class. Defined Color Red. Reference Number: 3S26E5. MPN: GDOCN - Hope - Grip Doctor - Bar End Plug. Rubber wedge expands safely inside the bar for maximum retention. Protect your handlebars while adding a dash of class. We are out East at 3063 Columbia Ave. - Lancaster PA, 17603 and out West at 3481 Old Conejo Rd. #105 - Newbury Park, CA 91320. MPN: GDOCS - Hope - Grip Doctor - Bar End Plug. Rubber wedge expands safely inside the bar for maximum retention. Protect your handlebars while adding a dash of class. We are out East at 3063 Columbia Ave. - Lancaster PA, 17603 and out West at 3481 Old Conejo Rd. #105 - Newbury Park, CA 91320. MPN: GDOCR - Hope - Grip Doctor - Bar End Plug. Rubber wedge expands safely inside the bar for maximum retention. Protect your handlebars while adding a dash of class. We are out East at 3063 Columbia Ave. - Lancaster PA, 17603 and out West at 3481 Old Conejo Rd. #105 - Newbury Park, CA 91320. We owe it all to listening to you. Rubber wedge expands safely inside the bar for maximum retention. Protect your handlebars while adding a dash of class. Color Black. Defined Color Black. Reference Number: 3S24E5. We owe it all to listening to you. Rubber wedge expands safely inside the bar for maximum retention. Protect your handlebars while adding a dash of class. Color Silver. Defined Color Silver. Reference Number: 3S27E5. MPN: GDOCB - Hope - Grip Doctor - Bar End Plug. Rubber wedge expands safely inside the bar for maximum retention. Protect your handlebars while adding a dash of class. We are out East at 3063 Columbia Ave. - Lancaster PA, 17603 and out West at 3481 Old Conejo Rd. #105 - Newbury Park, CA 91320.